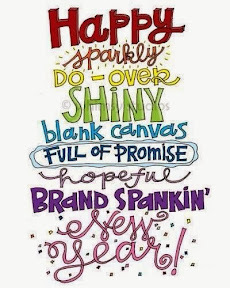 My Scrappy Life: Bits & Pieces: Happy New Year! Bits & Pieces: Happy New Year! I originally wrote this column for the Dec. 27, 2013 issue of The Grove Sun - my last editor's column for the year. It seems appropriate for today, the first day of 2014. - Happy New Year! As you read this, the 12 days of Christmas are in full swing (psst. Christmas really doesn't end until Jan. 6, on Epiphany) and the first day of 2014 is knocking on our doors. Are you ready for 2014? Well, I guess it doesn't matter if you answer no, because guess what — it will be here, ready or not — in a less than four days. A year — 365 days full of untapped possibilities — await you. What are your hopes and dreams this New Year? Do you have a resolution to make? If you are like me, the resolution made on New Year’s Eve is often left in the dust by spring break. In the last few years, starting in 2007, I’ve done something different. Rather than make a resolution that will fail, I've filled my days with a word to help guide my life. I’ll be honest, because I’m a “wordy” gal, I usually pick one word in January, and then by mid-summer, another has woven into my life. Such is the case in the first year, when I started looking for “wonder” around me, and later found myself “seek”ing out God’s will for my life. Other past choices have included simplicity and joy (2008), dream and hope (2009), half-full and see (2010), new and renews (2011) and rest and sabbath (2012). It amazes me the power a single word can hold, especially as I watch God use it to shape and define the things I encounter in a year. It's quite astounding really, when I think of the ways God uses the words I choose to speak to me — through the experiences that fill my days. In 2013, I began the year with "imagine" and that word grew to include "rejoice." I will admit, however, I spent most of the year focusing on "imagine." I found the word imagine (or maybe it found me) before Christmas 2012, when a friend and ministry colleague handed me a rock with the word imagine engraved on it. He challenged me to "imagine" the freedom that can only be found because of God's love. He also challenged me to consider the things in store for my life, that may seem beyond my imagination. At that time, God only knew how the word would shape my year. In the past year, God has used the word to challenge me to imagine a new direction in life — and even a chance to return to the newsroom. Was it easy? Absolutely not. But things that challenge us are often what ultimately bring us the greatest joy and satisfaction. This year, my word came to me as I spent time putting together the "Christmas adventure" that unfolded for Sunny the Elf on The Grove Sun's Facebook page. I'll be honest, I laughed a lot as I not only took the pictures, but as Samantha and I put the storyline together on Christmas Eve. Life gets pretty serious, especially in a newsroom. Sometimes laughter is truly the only medicine to get through the day. So I'm starting the year with a goal to find ways to fill my days with laughter. So what word would you use for 2014? What comes to mind? Maybe it’s “new” or “adventure” — because of the endless possibilities that await you. Or maybe it’s “friend” because you want to focus on building or repairing friendships with the people around you. Ultimately, there’s no right or wrong answer to this idea. You simply pick a word to help define your hopes and dreams for 2014 — then start looking for the things God wants to teach you using the word. A new year — 365 days as clean as a page in new sketchpad — and new opportunities. What will you create this year? Kaylea M. Hutson is the managing editor of The Grove Sun. She can be reached at kaylea.hutson@grovesun.com or 918-786-2228. Note. This column appeared in the Dec. 27, 2013 issue of The Grove Sun. Click here for the original link. So excited to grow with all you OLWers this year and God is winking at me because so many of us are seeking God, who knew? And I have to go online to meet you! I had such a rough year last year I really wish I had thought about having LAUGH as my word! Great choice! Laugh! Great word! May it bring you much joy.